Interesting post, as always. I think as a woman one feels this kind of emptiness too when it comes to our bodies just serving no useful purpose as we sit at our office jobs. The best solution I can think of is to go surfing! It’s also completely useless in a practical way but it definitely makes one feel more hero than victim. Yes, I think it’s so important to have a physical activity that counteracts all of that chair/couch time. I go to the gym first thing in the morning, and it keeps my mind clear and body strong throughout the day. It’s like tuning up, or running the motor to keep the battery from dying. When I worked my first useless office job, I lived for ballroom dancing after my shifts. It was the only thing that got my through it. It seems to me that ballroom dancers live longer than anyone! Your story seems more interesting than Shann Ray’s. I’m in a hurry but I couldn’t stop reading until the end and now need to acknowledge it in comment. You’re a natural storyteller who conveys a genuine sense of honesty in well written prose. Very well done Lauren. Thanks Mike! I really appreciate it! 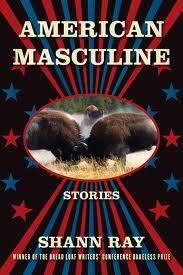 ‘American Masculine’ was a weighty, depressing read. At a writer’s panel a woman said that she feels writing fiction is even more vulnerable than memoir. I didn’t quite get what she meant at first, but the more I think about it, I see what she means. I questioned whether Shann Ray has the same poverty of mind that he wrote about in his characters. You are currently reading The Sons That Got Away at Lauren J. Barnhart.